Appropriate for an indoor or outdoor use, the beam of the PRT is built on an I beam profile designed for an intensive use. 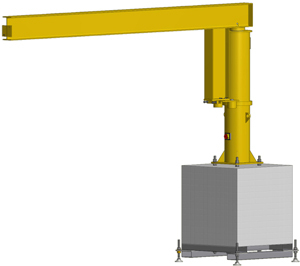 The total rotation is on 360 ° and can be assisted by an engine (optional).The optional installation of a hoist motor direction is possible. This jib crane is mounted on a movable concrete block provided. Displacement can be done by traveling crane (transport ring) or by forklift. Motorization on main roller (indoor use). 4-ring electrical collector, for unlimited rotation.